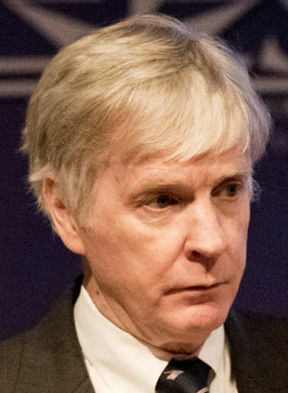 Ryan Crocker served as the U.S. ambassador to Lebanon, Kuwait, Syria, Pakistan, Iraq and Afghanistan. The United States’ ongoing negotiations with the Taliban without the Afghan government have delegitimized the government the U.S. claims to support, according to a six-time ambassador and the former dean of the Bush School of Government & Public Service. Ryan Crocker, who served as the U.S. ambassador to Lebanon, Kuwait, Syria, Pakistan, Iraq and Afghanistan, made these and other remarks during his return to the Texas A&M University campus Thursday. Crocker delivered a lecture on U.S. policy in Afghanistan, including the negotiations aimed at a cease-fire and withdrawal of American troops. A commitment from the Taliban that it wouldn’t allow terrorist attacks from Afghanistan is a major point of the peace talks. But without a U.S. presence in the country, Crocker raised the question of what army would enforce the Taliban’s observance of any commitments. “They will agree to anything right now, they will sign anything right now, because they know once we’re gone, we’re not coming back, and they can do whatever they want to do,” Crocker said. When President Donald Trump laid out his policy in the summer of 2017, Crocker said be believes the part he got right relates to his views that when it comes to Afghanistan, the U.S. needs to talk about conditions, not calendars. His predecessor, Barack Obama, stopped the withdrawal of combat forces from Iraq and Afghanistan at the end of his second term. Crocker said Trump had so far taken advantage of that hand-off but has become impatient. The war has been unpopular — “we have been there too long, it has cost too much, it’s never gonna work right” — but withdrawing forces gives the advantage to other forces with more patience, Crocker said. And the Taliban and al-Qaeda of today are “tougher, meaner, smarter and more committed” than they were 18 years ago, he said. There were more than 100,000 troops in Afghanistan when Crocker was there in 2011 and 2012, and now there are roughly 14,000. Meanwhile, the Taliban doesn’t have a provincial capital or major highway under its full control. The Taliban is “holding their own,” but maintaining a troop commitment is a “cheap enough insurance policy” for U.S. national security, he said. Having the Afghan government at the table could potentially change this dynamic, though. Crocker said he can see the possibility of the two coming to terms on some set of issues, moving the conflict toward something more nuanced. But he said this won’t happen without the Afghan government’s involvement. Crocker’s lecture was hosted by the Department of International Affairs, the Scowcroft Institute of International Affairs and the Albritton Center for Grand Strategy at the Bush School of Government & Public Service. The current state of the diplomatic profession in the United States is, in a word, “poor,” said Ambassador Ronald Neumann during a talk Tuesday on the Texas A&M University campus. Texas A&M Bush School of Government and Public Service executive professor Andrew Natsios testified before a U.S. House subcommittee this week on what he described as the numerous and multifaceted worldwide benefits of U.S. foreign aid. In 1979, the United States and the People’s Republic of China established a diplomatic relationship. Forty years later, there have been several accomplishments — and plenty of remaining friction. As the new trade deal to replace the North American Free Trade Agreement waits for approval, a panel of experts from the United States, Mexico and Canada reflected on NAFTA on Wednesday at the North American Trade Symposium. Vice President Mike Pence and two of his predecessors spoke at the Bush School on Friday as part of an evening of reflection on the evolving nature and role of the U.S. vice presidency.